Oly Town Artesians opened their outdoor season against Yakima United. JT Meyer scored to record a tie in the game. Photo courtesy: Oly Town Artesians. 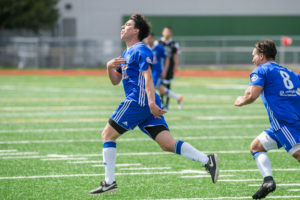 It took 73 minutes, but the Oly Town Artesians (0-0-1, 1 point) scored their first Evergreen Premier League goal in team history when Olympia native JT Meyer buried a shot to level the score with Yakima United (0-0-1, 1 point) at 1-1. 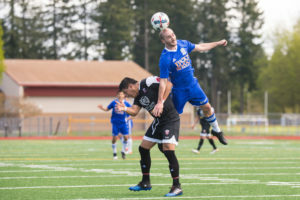 The score line held for the remaining time and the Artesians earned their first league point in front of their home crowd at South Sound Stadium on Sunday afternoon. Meyer’s goal came 55 minutes after Yakima United scored their first goal of the season. Alex Molchan gathered a deflection and found himself in open space to beat Oly keeper JJ Olson. Ceveriano Garcia was credited with the assist and Yakima took a 1-0 lead in the 18th minute. 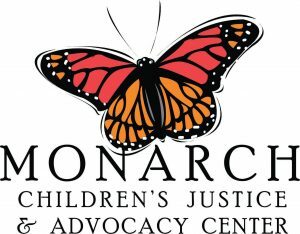 Olson faced three shots on goal during the defensive battle, making two saves, while Yakima keeper Antonio Gonzalez faced just two shots on goal, making one save. Both backlines played well, especially when pressure ramped up late in the second half, and included standout performances from Yakima veteran Dennis Stevenson and Oly’s Brady Espinoza, amongst many others. Both teams had fantastic chances to break the tie late in the game, including a point blank opportunity for Daniele Zaccagnini that took an unlucky bounce and hopped up on to the top of his foot and over the goal in the 89th minute. 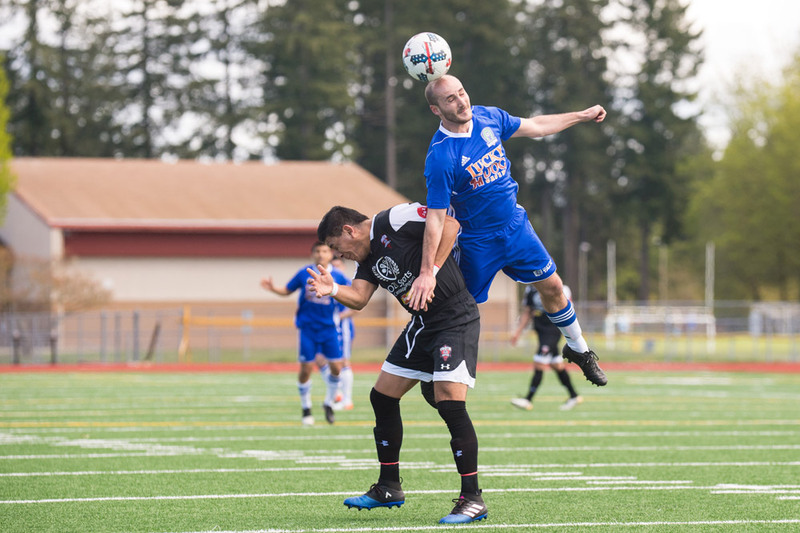 Kyle Wiese goes up for a header in the opening game of the season for Oly Town Artesians. Photo courtesy: Oly Town Artesians. Yakima was called for more than twice as many fouls over the course of the game, committing 15 infractions, while Oly was charged with just seven. But the biggest foul was not called. A Yakima defender clearly committed a handball in the box in the 69th minute, at least to the hometown faithful, but the officials did not have the view and did not award the Artesians the penalty shot. The Artesians will look for their first W of the season next Sunday against Bellingham United. First kick is scheduled at 2:00 PM at either The Evergreen State College or South Sound Stadium. The field of play will be determined mid-week based upon the forecast. Follow the Artesians all season long by visiting www.olytownfc.com, following them on Twitter at twitter.com/OlyTownFC, and liking them on Facebook at FB.com/OlyTownFC.